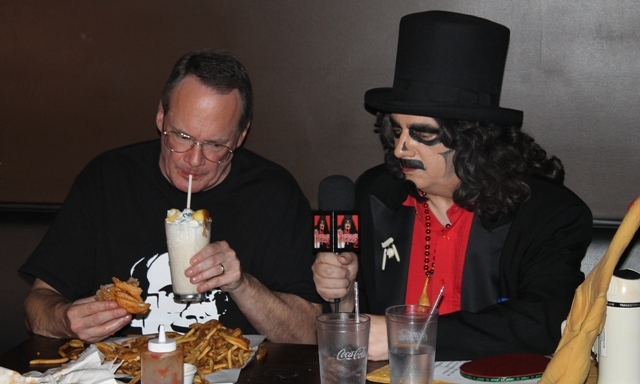 Jim Cornette and the Svengoolie Burger Challenge! With just a few days recovery from mine and the other Terror Dave’s vacation/road trip, it was time to resume my favorite Chicago past time…keeping up with national horror host, Svengoolie! We enjoyed seeing him at Brookfield Zoo for my AAZK Chapter’s annual Vital Grounds fundraiser (which David covered HERE) and were honored when he agreed to also have dinner with us the following evening (this time as mild-mannered Rich Koz) along with Jim Roche at The Squared Circle restaurant. The Squared Circle is owned and operated by the stunning, Lisa Marie Varon and has become my favorite Svengoolie hotspot (yes, even over my beloved Brookfield Zoo). 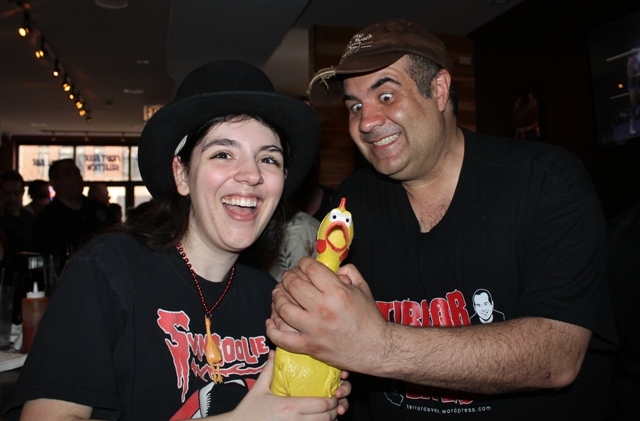 Aside from the fact that the food is incredible and the service is top notch, Ms Varon is so much more than just a talented pro-wrestler and restaurateur; she’s a fellow admirer who has a knack for creating the best Svengoolie experiences for the rest of us fans to enjoy. And this time, dear readers, I believe she may have even outdone herself! 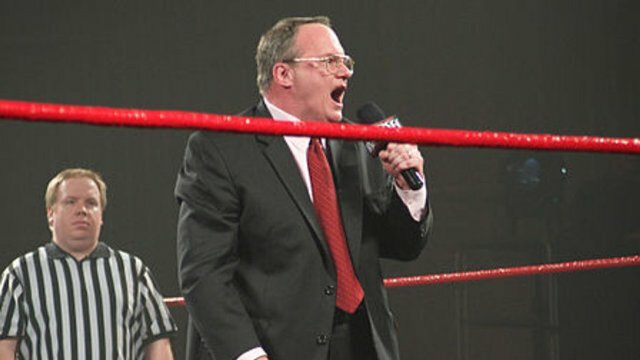 David’s fandom should not be taken lightly as during the time of Cornette’s zenith, wrestling was broken down into over a dozen territories unlike the federations, WWE, and TNA you see today. Cornette’s antics were never televised in Rhode Island and the fact that my co-blogger became so enthralled via the occasional VHS purchase is surely testament to Cornette’s appeal. This event would see the teaming of both Cornette and Svengoolie as the former prepared to take on his opponent more directly via “The Svengoolie Burger Challenge!” As I said, Ms Varon never disappoints. Once again her abilities proved spot on as we arrived early enough to locate an open table directly across from where Svengoolie and Jim Cornette would be signing. Following on our heals was super-fan Brian Bernardoni who took the table next to us along with his father, Alan, and a friend. Jamie Lee Cortese arrived with her dad too and joined us at our table. In the space of mere moments, the Goolies were all assembled! Don & Bunny ordered a pizza and appetizer. The pizza here is incredible and David said it was the best he’d ever had (I know he’s from New England and you’re probably thinking, “Well what the hell does he know about good pizza?,” but I’ve been schooling him on Chicago pizza every visit and he ain’t wrong). In keeping with the spirit of this event, however, I opted to skip breakfast and lunch and order a Svengoolie Burger. 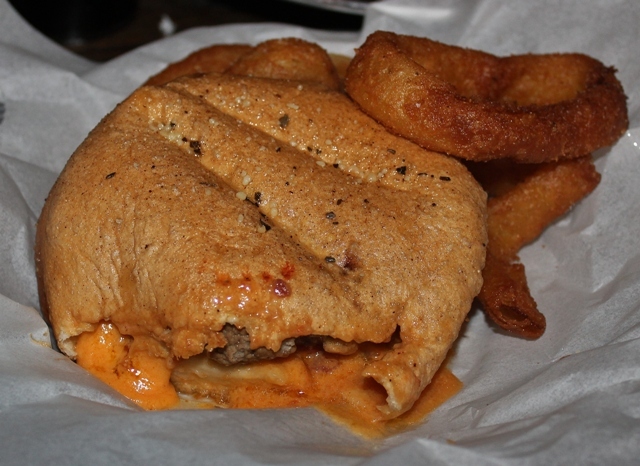 Incidentally, this is the fourth time I’ve eaten one so before we get into the dynamics of Jim Cornette’s “Challenge,” I think it’s pretty clear who’s currently holding the Sven-Burger heavy-weight title…and at this stage of my life, I do mean HEAVY. It wasn’t long after we ordered that Lisa grabbed the blow horn and announced Cornette’s arrival. As soon as he entered the room it became apparent why he was so popular despite his status as a “villain.” The man definitely knows how to fire-up a crowd with his energy (not unlike Ms Varon’s I might add) and once again David’s assessment was spot-on. By the time Cornette arrived I had already downed half my shake. 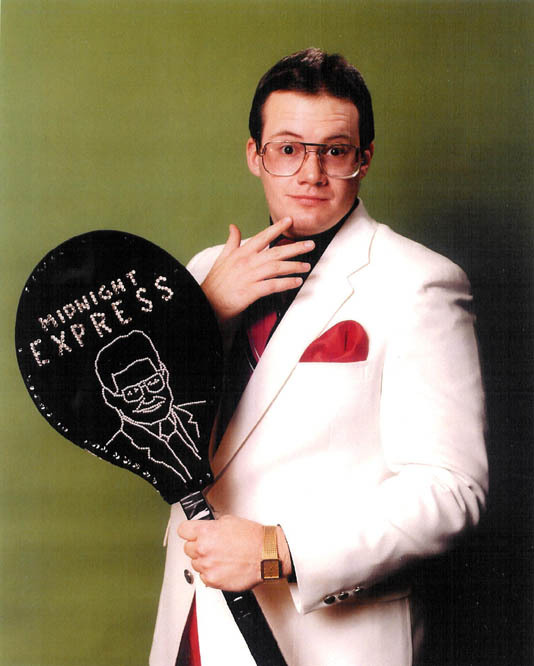 This was at odds with my wanting a picture with Cornette while holding a photo-worthy Midnight Expresso shake…thereby prompting me to order a second. Yes it was a dirty job but somebody had to do it. Lisa retrieved the blow-horn from Cornette and then introduced the next heavy-hitter, Svengoolie! He said a few words and the two celebrities exchanged banter before settling in to greet the fans. 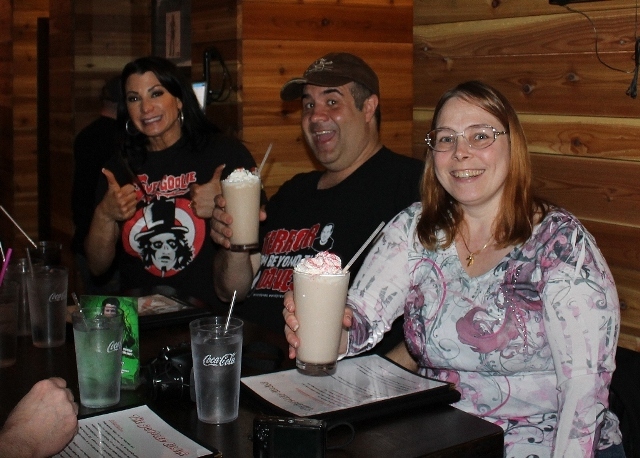 Fortunately the line was relatively short by the time my Svengoolie burger arrived and I grabbed my dinner & shake to pose with their namesakes. Bunny, you may be a Master at scoping out his locales but, so far as creating hammy Svengoolie photo-ops is concerned, I’m pretty much Yoda. I returned to my seat and scarfed down the burger and the second shake. It wasn’t long before my previously empty stomach felt queasy and I was in desperate need of some Tums. “You finished the whole thing?? ?” Bunny asked incredulously. “Uh…yeah….” I said, while feeling an unholy mix of buzzed and bloated. Bunny offered her sympathies. 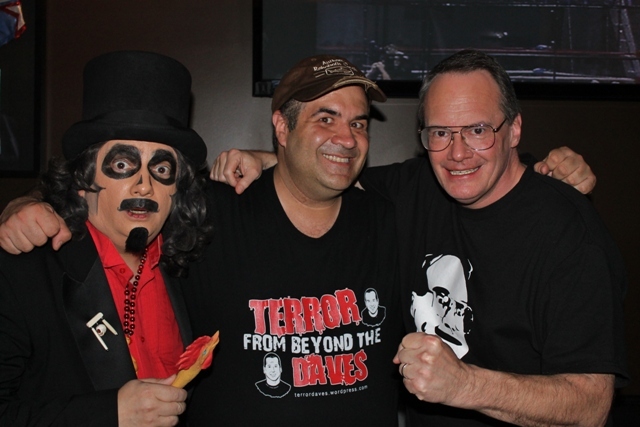 My getting pummeled was just the teaser as tonight’s “A-Show” featured Cornette not only taking on the Svengoolie burger but a whole lot more! The veteran manager was in danger of biting off more than he could chew (literally) by not only attempting to finish the burger in 30 minutes but with the addition of a double order of french fries and a Twinkies milkshake (his choice)! Could he do it? Bunny and I were optimistic while Don predicted a loss. “I really think it’s the fries that are gonna do him in,” he said. As Cornette began tearing his opponents apart, Svengoolie and Lisa Marie provided commentary. Jim Roche stood nearby with the camera crew while keeping time. Jim Roche captures us capturing the spectacle! My friends from the Lincoln Park Zoo arrived after the match; Allycia and Marisa. 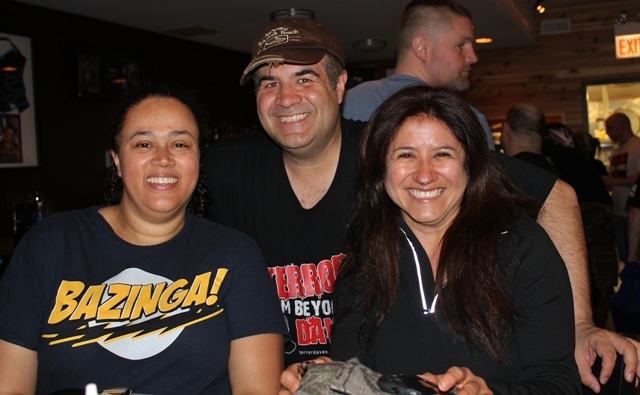 They were later joined by Chicago Red-Eye writer, Elliot Serrano. Although missing the main event I do enjoy their company and was glad they came. We Goolies gave them our seats which was fine because I needed to start walking off that burger! 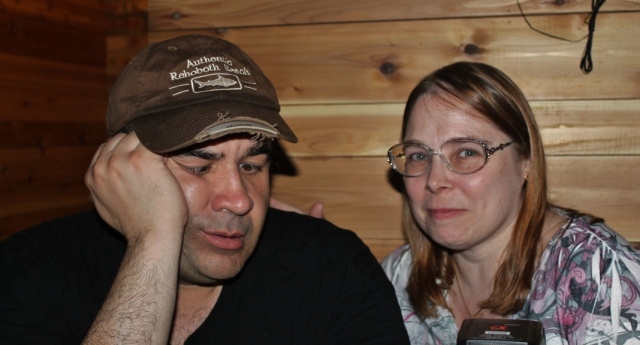 I was also surprised to also see author, Ursula Bielski, in the crowd. I had just written about her awesome book, “Graveyards of Chicago” during a story I did on Showmen’s Rest (covered HERE) and now here she was! Apparently Oprah’s got nuthin’ on me when it comes to using The Secret! Actually it’s no secret at all that everyone in this town loves Svengoolie! The aforementioned Brian Bernardoni did something amazing for Sven which he announced after wards but it’s something I can’t share at this time. Suffice it to say, I will delve into that after it becomes official but only after Sven breaks the news first. At this time you’ll just have to take my word for it that it’s a HUGE deal and shows what an amazing guy Mr. Bernardoni truly is! And so concluded another amazing Svengoolie appearance at The Squared Circle that, for me, ended the same as last time…asking Lisa Marie Varon when she’ll be scheduling the next one. As you may have guessed by the presence of Sven’s crew, this event will be shown in an upcoming Svengoolie segment so keep watching his show for that. If you’d like a peak of my own unprofessional footage, you can check out the 11 minute clip below. 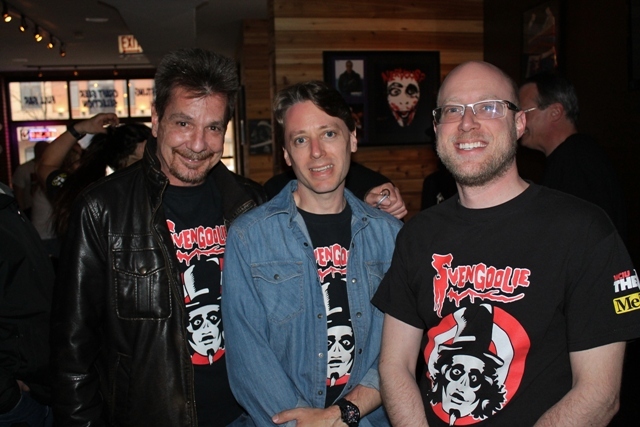 As for me, I had no sooner concluded another Svengoolie appearance when planning the next one at C2E2. Stay tuned for that memorable day right HERE (no, that’s not a link, just a reminder to keep reading “Terror from Beyond the Daves”). This entry was posted in Horror Hosts, Stalking Svengoolie! and tagged Jim Cornette, Svengoolie, The Midnight Express, The Squared Circle. Bookmark the permalink.